I was at Home Depot the other day because Thunder absconded with our rake. And then she ate it. Bravo, my friend. Bravo. Even though I have no toilet issues that need solving at this time, I feel like we understand each other. I feel like you’re a dreamer. Why do I think that? Because I doubt this idea came from corporate. 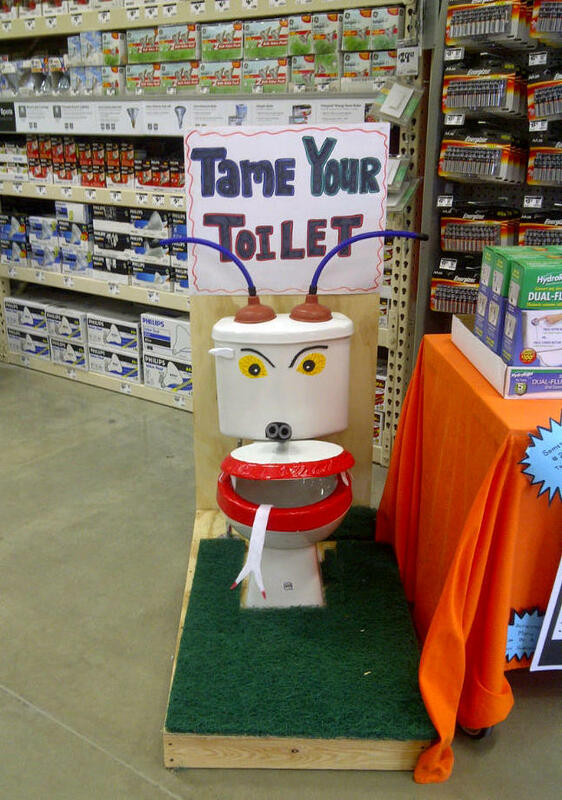 I doubt upper management’s business plan vis-a-vis plumbing equipment was for each store to nominate one employee to hand-decorate the old demo toilet. Well “hells yes” to you, buddy. Hells yes. That is the kind of ownership and initiative we should all be taking. We could stand to spend a little more time identifying problems and proposing real solutions around here. All we need is an idea, a patch of fake grass from aisle 4, and some poster board from aisle 20 to get this thing started. I agree with you that we can’t wait for the big ideas to come down from on high, and we can’t wait for permission or approval. Kind of like how you didn’t run the Toilet Monster by your manager before you rolled it to the front of the store. And you know what? It worked. It worked because I came home with a 3-pack of 5/16″ x 3″ galvanized steel toilet tank bolts and a Fluidmaster Adjust-a-Flush 2″ toilet tank flapper, and I have absolutely no idea what they do. And Happy Thanksgiving to you too, everyone! You may find yourself over-stocked on turkey this weekend. You might curry it right up into a colorful, tasty salad. I used chicken for the salad pictured here because I’d be nuts to make two turkeys in one week. You could definitely use Indian chutney, but the closest thing I had was pepper jelly (like a sweet and spicy pepper relish), and it was great. You can leave out the turmeric if you don’t have it handy. Wash the potatoes and boil them until they are “fork-tender.” Cooking time will vary from about 10-20 minutes depending on the size of the potatoes, but you should be able to slide a fork all the way into them. Do not boil so long that their jackets pop off. Remove potatoes and run under cold water to stop the boiling. Remove skins with a knife or a vegetable peeler. Cut the potatoes into bite-sized wedges and place in a large bowl. If you have left-over turkey or chicken, dice it into bite-sized pieces. Otherwise, bring a pot of salted water to a boil. Lower heat just a little to a simmer. Add chicken and simmer (uncovered) for about 8 minutes. Turn off the heat and cover the pot. Let it stand until chicken is cooked through, about 15 minutes. Confirm that it’s not pink in the middle, and remove chicken to cool. When it is cool, dice it and put it in the bowl with the potatoes. Wash the 2 red peppers and remove the ribs and seeds. Chop the red peppers into pieces about 1 inch by 1 inch big. Place them in the large bowl containing the potatoes and chicken. Wash the celery and peel it. Cut celery at a slant rather than straight down. Place celery in the same large bowl. Add any chopped apple, mango, raisins (simmered in some orange juice until plump) or halved grapes, if desired, to the bowl. In a different bowl, whisk together the 1/3 c. plain yogurt, 1/2 c. mayonnaise, 5 tsp. curry powder, 1 tsp. turmeric, the juice of 1/2 lime, the 1 1/2 tbsp. brown sugar (or honey) and the 3 tbsp. pepper jelly or pepper relish. Peel the ginger root and cut into several pieces. Pass the ginger root through a garlic press and whisk the resulting juice into the bowl with the spices. Adjust the spices, sugar, and salt and pepper to taste, and then combine the dressing and the chicken/chopped ingredients. If using almonds or pecans, toast them at 350 degrees for a few minutes, until they are aromatic and barely browned. If using cashews, you don’t need to toast them. Serve the salad sprinkled with green onion and nuts. We will have to have you over very soon–you may want to take that back after you see the cushions on our couch! Heh. 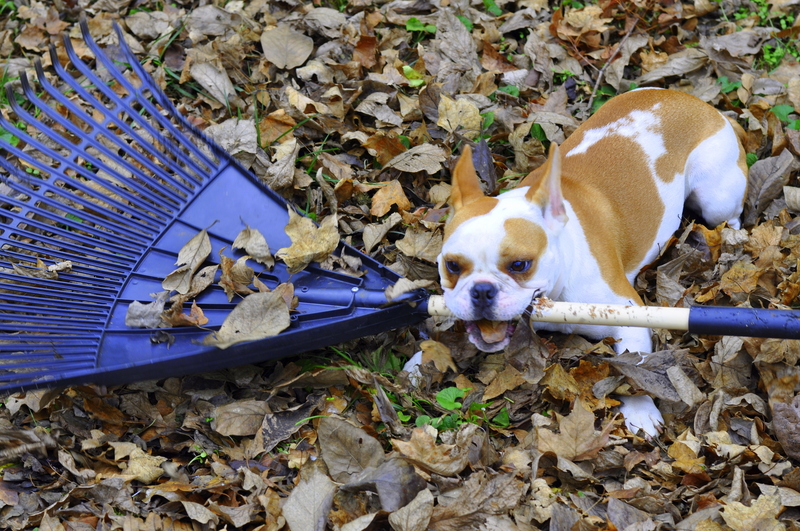 I’m wondering – has Thunder pooped that rake out yet? LOL Love your blog!!! I have 4 deeply insane dogs so I feel your pain. Shelley, that sounds like an amazing evening that I would love to be a part of. Next time I am in Florida, I am on it because (A) that sounds fun, and (B) I would love to see how having four dogs has not made you convert what I imagine is a very chewed-up couch into a boat and set sail for the high seas by now. Have you considered the possibility that a ninja squirrel is responsible for your exploding scrambled eggs? Just throwing that out there–I don’t think you should rule anything out at this point. Believe me the high seas are frequently extremely tempting – particularly after the scrambled egg incident. And, although I have as yet, not been able to prove the ninja squirrels were in some way involved – they have been informed that they shouldn’t leave town till we get to the bottom of things. I am not above holding the peanuts hostage till they tell me what they know…. No seriously, the Toilet Friend is the best thing I’ve seen all day. And I respect that your dog absconded with your rake; mine likes to make off with anything that looks remotely rope-like. Not Supermom, I just read your blog and love it and am going to keep reading it. I thought your post entitled “Dear Christmas” was beautifully written. Thanks!! I have every intention of sticking around these parts, too. 🙂 I WUB Thunder. Very entertaining post. 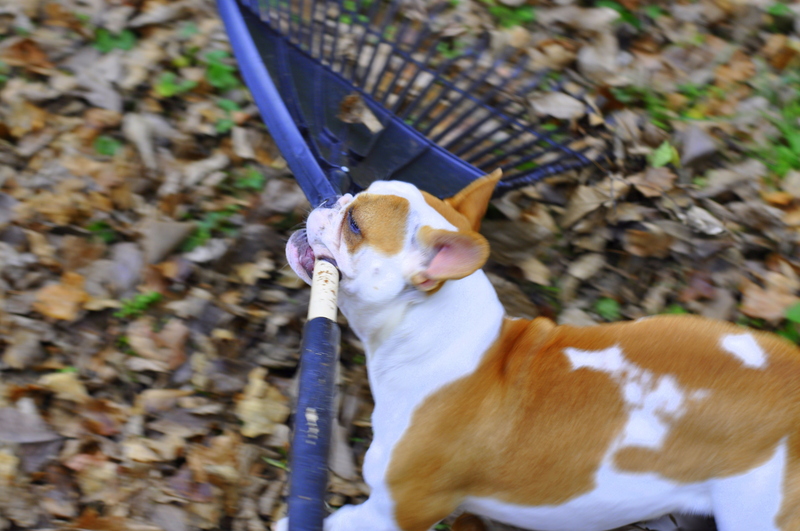 I have a Boston who hates any garden tool with a long handle and will bark and attack for hours on end. Your Boston is gorgeous! Never seen one with that coloring. Hi! Thanks for your note. 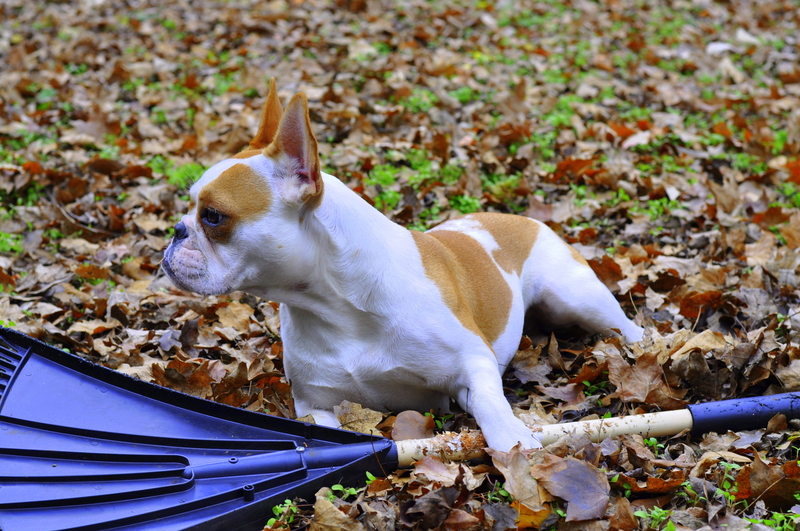 I can see how she looks like a Boston, but she’s actually a bulldog– she’s a cross between an English and a French. Spunky, and extremely stubborn. 🙂 Happy New Year.